Ontario, Calif. - The Ontario Fury has added defender Troy McKerrell to its roster for the remainder of the 2018-19 season. McKerrell, who is based in the greater Los Angeles area, joins the squad immediately and will be eligible to play in Sunday's away match against the San Diego Sockers. The Isle of Bute, Scotland, native has prior experience with fellow Major Arena Soccer League (MASL) outfit Kansas City Comets. He will wear jersey number 19. Early in his career, McKerrell signed professionally with Greenock Morton FC in his home country. He also played for Benedictine College in Kansas, earning All-Conference honors while helping lead the Ravens to the HAAC Conference and Tournament titles and a spot in the national tournament. The now 28-year-old earned a Master's degree in Organizational Development and Psychology from Avila University in Missouri last year and subsequently moved to Southern California to become the CEO of Define Sports & Entertainment, which he co-founded. Throughout his endeavors away from the pitch, McKerrell has consistently worked to improve his game, suiting up for Australia's Heidelberg United FC as well as stateside for a trio of USL League Two (then PDL) clubs, Des Moines Menace SC, Midland-Odessa FC and St. Louis Lions SC, followed by a stint with the Comets during the 2017-18 campaign. The defender also boasts extensive experience assisting fellow high-level players. In his native Scotland, he has worked with out-of-contract professionals looking to stay sharp and find new teams, in addition to being a member of the coaching staff of the Patrick Thistle FC academy. In the United States, McKerrell has been an assistant coach with NWSL outfit FC Kansas City, Rockhurst University in Missouri and William Penn University in Iowa. He holds a UEFA B license and will complete his UEFA A course in May 2019. "Troy is a valuable addition to our squad," said Fury Head Coach Jimmy Nordberg. "Given his background, it's clear he has demonstrated both a pronounced drive to challenge himself on the field and a deep motivation to grow his overall understanding of the game. Those factors make him a tremendous asset inside our locker room and we can't wait to integrate him with the rest of the guys as soon as possible." 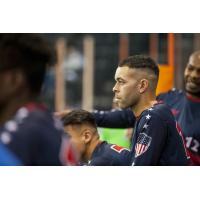 Troy McKerrell and his Ontario Fury mates travel to take on rivals San Diego Sockers this coming Sunday, March 10, and fellow playoff contenders Tacoma Stars on Friday, March 15. They return home for a massive meeting with the El Paso Coyotes on Sunday, March 24. Tickets to all Fury games at Citizens Business Bank Arena may be purchased by visiting www.ontariofury.com or by calling 909-457-0252.